Singing was closely related to early wizardry. In many of the earliest legends in which they appear, the wizards and wise-women simply sing their enchantments into being. Some are as simple as love spells, while others move mountains and change the faces of entire worlds, and even raise the dead. 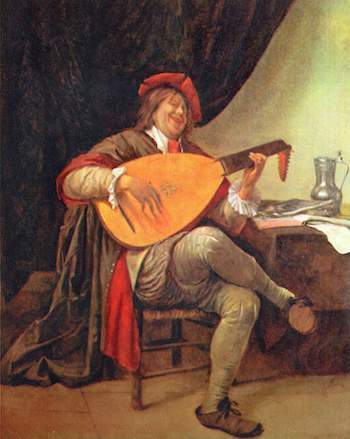 Most of history was passed orally through epic tales, almost always by performers known as skalds or bards. The most treasured bards wove magic through their music, primarily through their lyrics. Homer's Iliad, largely considered the first Western work of literature, was meant to be sung. This tradition continued well into the 14th-Century, as Merlin -- the wisest and most well-known of all wizards -- employed singing in many of his spellcasting feats. One of the most well-known of the skalds was the Welsh bard, Taliesin. Taliesin was an actual, historical poet of the 6th or 7th -Century, responsible for writing and popularizing many of the earliest-known Welsh myths. In legend, he was the son of a witch named Ceridwen. When Talisein, in another form, spoiled one of Ceridwen's potions meant to give her lame son all the knowledge of the world, Ceridwen pursued him in many forms until she ate him in the form of a seed. The witch then gave birth to the beautiful Taliesin, who eventually carried a magic harp, and cast magic through his songs. This appears to have been common-thinking, worldwide: Many sorcerous operations involved singing, chanting, or playing instruments. Dancing featured prominently, as well. As late as the 18th-Century, dancing and singing at different times of the day or year were associated with witchcraft. By the 16th-Century though, Magic -- Astrology and Alchemy, in particular -- had become scholastic pursuits, and the wizards of legend were revered more in theory than as actual, and possibly (once) living, beings.